Oh, holiday traditions – going to cut down Christmas trees, decorating the tree while listening to festive holiday music, proceeding to forget to water the tree for the next four weeks, and then finally the thrill and excitement of unexpectedly stepping on pine needles for the next 11 months that are hidden in the carpet like little pokey holiday elves. See? Even my dog found pine needles everywhere! Ah yes, let the fun begin! Seriously though, I love fresh cut Christmas trees! Christmas is not Christmas to me without the fragrant piney essence that emanates from a real Christmas tree! I would happily sleep on a whole bed of pine needles before I’d switch to a fake Christmas tree! In our household we kick off the Christmas season with a trip out to the Christmas tree farm, about a half an hour away, and spend an hour aimlessly wandering around sizing up every single tree till we find the perfect one. In reality, it is likely no better than the first tree we came across, but the adventure is in the hunt! 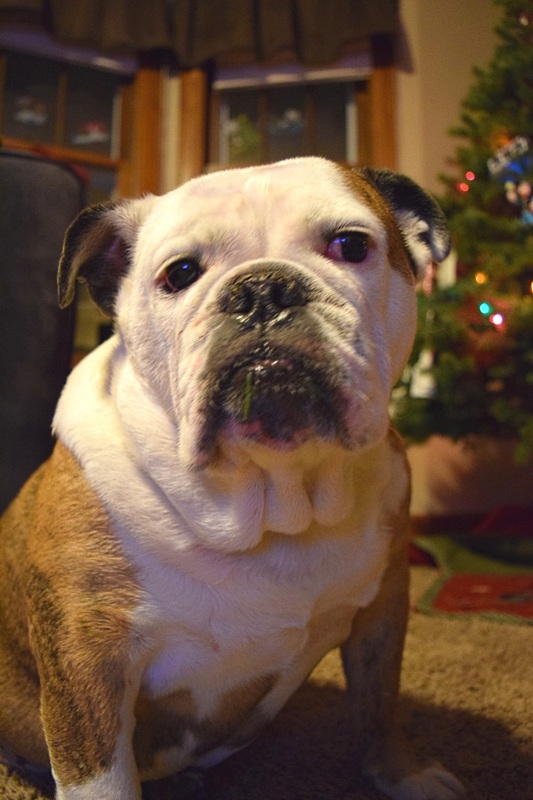 Once we have the tree in our home Christmas music bellows from every speaker in the house as the ornaments are unpacked. And, of course, decorating a tree isn’t complete without a festive drink. Often eggnog is the drink of choice, but last year hot chocolate found its way into festive mugs. This year we will be doing a twist off of that by spiking the hot chocolate with peppermint and Starbucks coffee to make Peppermint Coffee Hot Chocolate! What’s better than a jolt of caffeine to kick off the holiday season this year! You should be able to find a wide variety of Starbucks coffees at your favorite retailer. 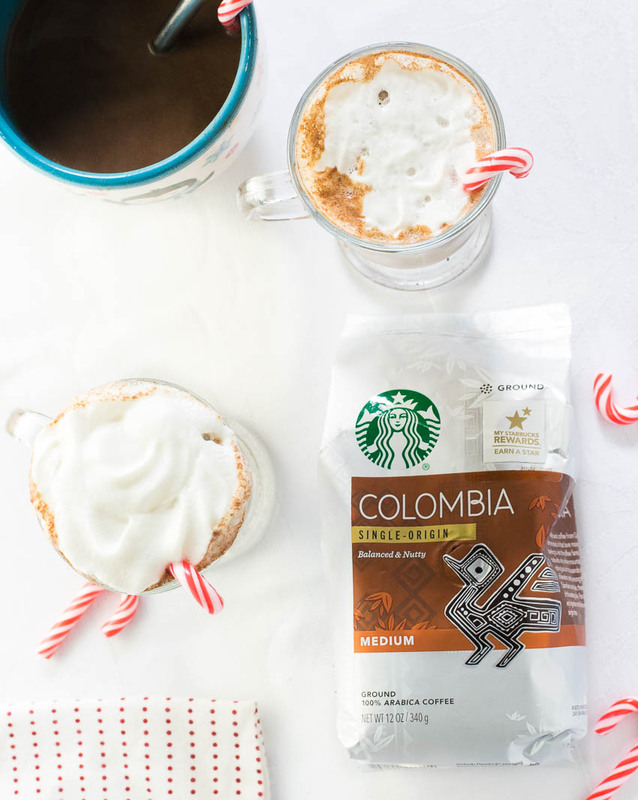 I used Colombia that I picked up at Walmart for this drink because the nuttiness is a good compliment to the chocolate, but pretty much any of your favorite Starbucks blends should work great! 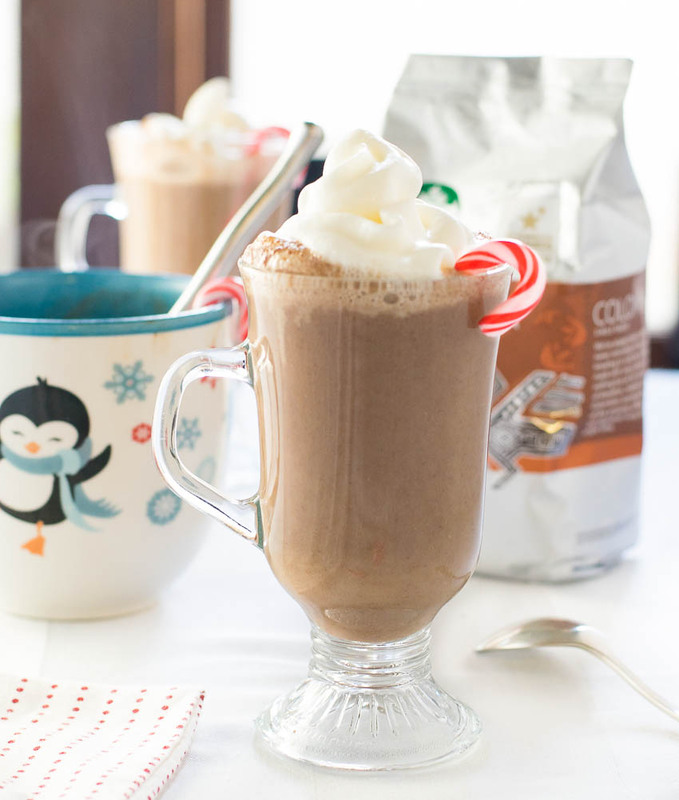 Ring in the holiday season with a rich, creamy, hot chocolate spiked with peppermint and caffeine! Heat 1/2 cup of the milk and chocolate on low in a sauce pan and whisk to combine as it melts. Slowly add chocolate mixture by the spoonful into egg yolks, while whisking continually. Add the remaining milk and peppermint extract and heat to temperature. 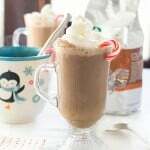 Add hot coffee and serve with whipped cream on top and peppermint candy cane for garnish. Egg yolk can be omitted but I recommend using it because it adds a delectably thick and creamy mouthfeel. 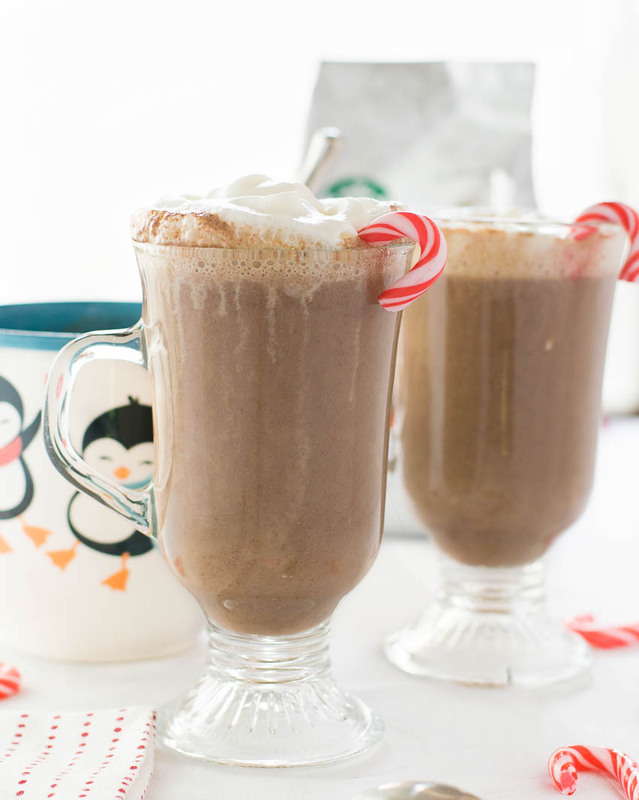 If you enjoyed reading my Peppermint Coffee Hot Chocolate recipe then be sure to check out all the different ways Starbucks can make your holiday merrier this year! You should also probably like me on Facebook and follow me on Pinterest too. That’s what I would do at least, because if you don’t get to know me but you still use my recipe it is kind of like taking candy from a stranger, and your mom taught you not to do that. Don’t disobey your mom, subscribe to Fox Valley Foodie today. This is a beautiful post! I’m in Janesville, WI and used to live in Appleton. Love the area. Looking forward to following your blog. Thanks so much for the kind comment! I’m thrilled you enjoyed it!